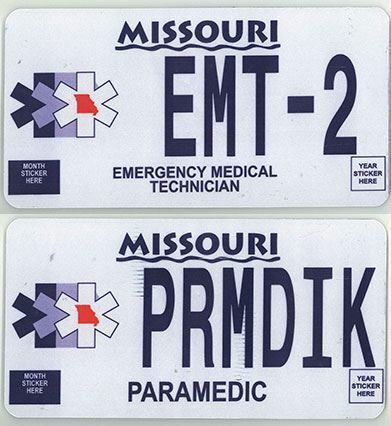 EMT / Paramedic license plates are personalized plates that may be six (6) characters in length. If the characters include a space, hyphen (-), or apostrophe (‘), the letters and/or numbers shall then be restricted to no more than five (5) characters, excluding the space, hyphen or apostrophe. MEMSA license plates are available ONLY for registered Missouri vehicles for an contribution of $15 per year to MEMSA or you can pay $30 for a two-year registration. If you need a license plate, you can follow the new/initial registration process outlined here. If you already have a license plate and need to renew your plate, please follow the renewal process outlined here.